Recently there has been a lot of talk of whether sunglasses should be allowed at the poker table, following the topic being discussed on one of the episodes of High Stakes Poker Season 6. It seemed most of the HSP players were vehemently behind a ban on sunglasses, except for Elky who kept quiet because he was wearing a pair at the time! Tom Dwan suggested he wouldn’t want to play in any non-televised game with a player wearing sunglasses because of his fears of them cheating, as it is purportedly easier to see marked cards through sunglasses. Day 3 was March 28th. 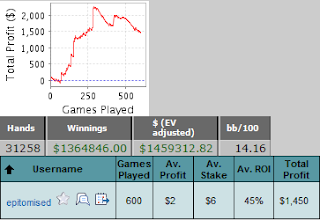 My first losing day, and as you can tell from my updated graph it was rather gross! However I'm not too concerned about it as I ran way below EV. I'm a bit worried that playing 180-mans and 45-mans at the same time is causing me to play the 45-mans worse, so I'll be keeping an eye on that in my next couple of sessions. 3 Comments to "Sunglasses at the Poker Table (+ SNQ Day 3)"
Hi there, enjoying your blog. Are you only playing SNGS ad MTTs to get to Supernova? Just curious. Hey man, Glad you like the blog! Nice one for the link fella!! !